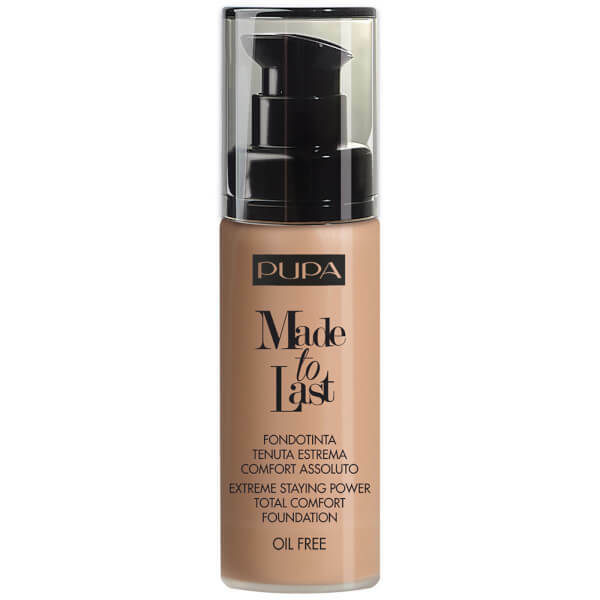 Embrace a flawless complexion with the PUPA Made To Last Extreme Staying Power Total Comfort Foundation; a long lasting yet comfortable foundation. Utilising ‘Last&Fix’ pigments which set firmly onto skin, the foundation is able to stay in place all day, maintaining the same colour and flawless finish. The unique, water-resistant formula delivers medium to high coverage that can be built up to achieve your desired look. Expect a shine-free, matte makeup look that lasts for hours. Free from Oil, Fragrance, Alcohol and Parabens. Dispense a small quantity of product on the back of your hand, then apply with gentle touches from the centre of your face going outwards, blending it carefully on the hairline. Finish by blending from the chin down to the base of the neck, in order to avoid unaesthetic color differences. For a professional result, apply product with the Foundation Brush of the Professional Brushes line of products, from the centre of face to its contours, from forehead down to the chin, blending on the neck.